Head to Tagor Village and enter the side door of the training grounds at 71,71. You can't enter the other doors until you become a member. Before you can use any of the facilities you must purchase a membership. Head to the Warrior Foyer and speak to Scribe. When they ask if you would like to purchase membership click "Yes". 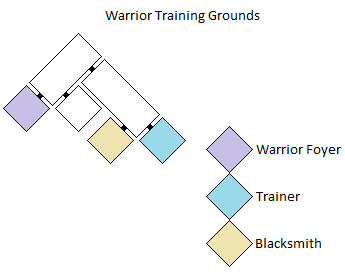 As a member you may use the Blacksmith to smith Two-Handed Weapons, and the Trainer to learn new skills. The trainer will also allow you to practise on a dummy.